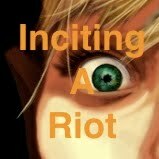 Episode 59 of Inciting A Riot: the Podcast finds us Inciting A Zimmelblob Riot! Find out what a Zimmelblob is, and why I proudly claim to be one, in today’s Spirituality Segment! But the fun doesn’t stop there!!! I just heard your topic on whether to use a negative word for positive and WOW! What century did you go to high school in??! I can't believe those horrible disgusting people who abused you! And the teacher too?! He should have been fired, and taken his teaching license away permanently, and those kids all expelled--they can take a GED test if the want to pass. BTW, I didn't know people still find gay offensive as here where I live in Portland Oregon, it seems to be used only as a positive like saying "Gay Pride Day". I'm surprised you didn't use the example which I feel is far more offensive. I won't spell it entirely out so as not to offend anyone, but I'll use the first letter and you'll know what I mean: the "Q" word. I usually hear it as a positive, but I know many don't like it. Enjoy your show! Keep up the good work.